This is the story of the birth of our third child. She was a Mother’s Day baby. Who knows when “pre-labor” was… I suppose I could say three weeks ago it started!! I tried timing contractions at Costco at lunchtime on Mother’s Day, but I’d forget to push the stop button on the timer so I couldn’t really tell if they were getting longer, stronger, closer together! I quit timing because it just wasn’t painful enough to be considered labor. “Pretty sure, just a sec.” I stand up and GUSH! “Um… yes, that’s affirmative, can I use the bathroom? Monkey (turning 2½ the next day) follows me into the bathroom & notices my undies on the floor. She leaves & in a second comes back with more undies & then grabs a pad from under the sink! Anyway, I sit there for about three minutes texting my birth team (photographer, videographer, babysitter). Then I get up, and before I got to the kitchen table, I was having a brutal contraction. Now THIS is worth of timing! Time to call the birth crew!!! Ha ha! So, I have no idea what time people started showing up… I was just in the middle of all this mayhem… trying to keep track of Monkey (2½ years) & Monster (14½ months) while Jesse got the pool set up & all the labor/birth supplies out, all while trying to monitor the turkey we had in the oven for dinner! Monster was getting into the pump for the pool so Monkey “babysat” him while Jesse was busy! It was chaotic to say the least. I was in HARD labor, all of a sudden! Jesse ended up asking the kids to stay on the couch, where they stayed until Lorie (friend & babysitter!) arrived. So… I think the first person to arrive was Kim and she started helping out with the setup. Then Inga arrived. I made some comment about how much I hated being on the couch. Inga said I could get up, she just didn’t want LaLa arriving before she did! So I got up & knelt before my birth ball. The relief was incredible. 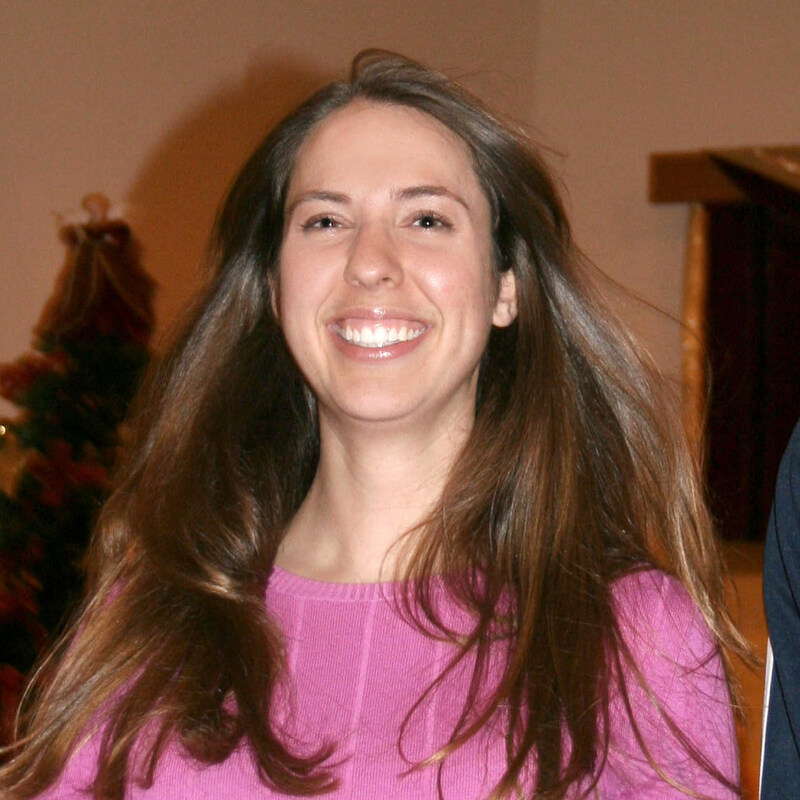 Between contractions I talked to my kids who were still obediently sitting on the couch. Monster was pretty traumatized, eyes as wide as saucers. I wish I could have hugged him & loved on him some, but the contractions were coming too fast. Finally, Lorie arrived (my friend, babysitter! )… the kids could be out of the room, and I could concentrate on the task at hand. Everyone was still scurrying around the room setting up… Jesse was hauling hot water from the bathtub in a large pot while the hose tried desperately to fill the pool from the sink! Brittany was snapping pictures & shooting video. Inga & Kim were testing the water & doing whatever else they do to get ready! It was a race! I was pushing, hard, but trying not to! Inga finally said I could get in the pool but I’d have to sit because there wasn’t quite enough water. I didn’t care… but I’d have to have this one more contraction out of the water. Dang it! As I lowered myself into the water I felt waves of relief wash over me! Aaaaahhhh… I can do this… again! It was so intense… I hadn’t had time to “get in the zone”… I didn’t have time to think! It was just happening so fast. A few contractions later I felt for her head inside of me & was surprised that she was so close. A little later… the ring of fire hit & in the middle of a contraction I squeaked, “She’s coming already!” I was so surprised! As I pushed her head began to emerge. I held her half-way out clear through to the next contraction. Then I pushed, her head came, I gave another push & there she was! Jesse & Inga both looked at the clock & said “58 mintues!” Yeesh! I tell you what, I’m glad I plan on delivering at home! LaLa would have been born somewhere on the freeway or in the hospital lobby had not been a home-birther! 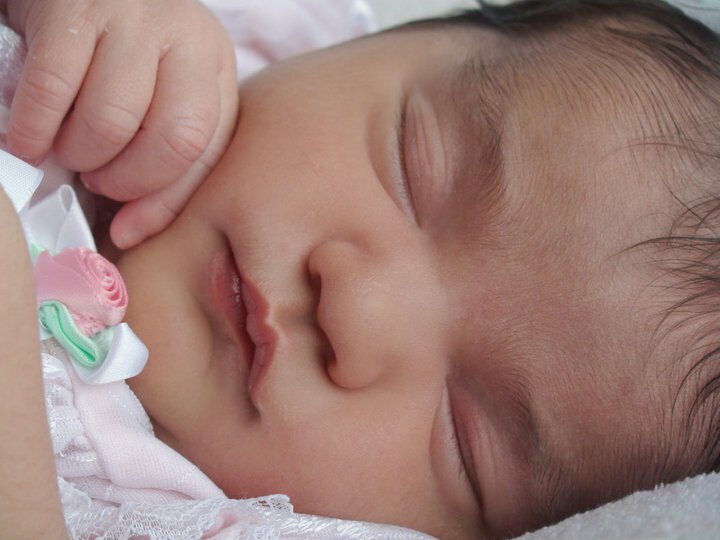 LaLa’s’ birth was the most intense of all three births… exciting, chaotic, rushed… but at the same time there was the peace & comfort of being in my own home knowing that I was being taken care of by people I loved & trusted. I had no fear during the whole process, even though I wasn’t able to get into that place of complete control because I didn’t have time to get there. It was a beautiful experience that I will never forget! And the best Mother’s Day present ever! I’m so thankful for my LaLa! 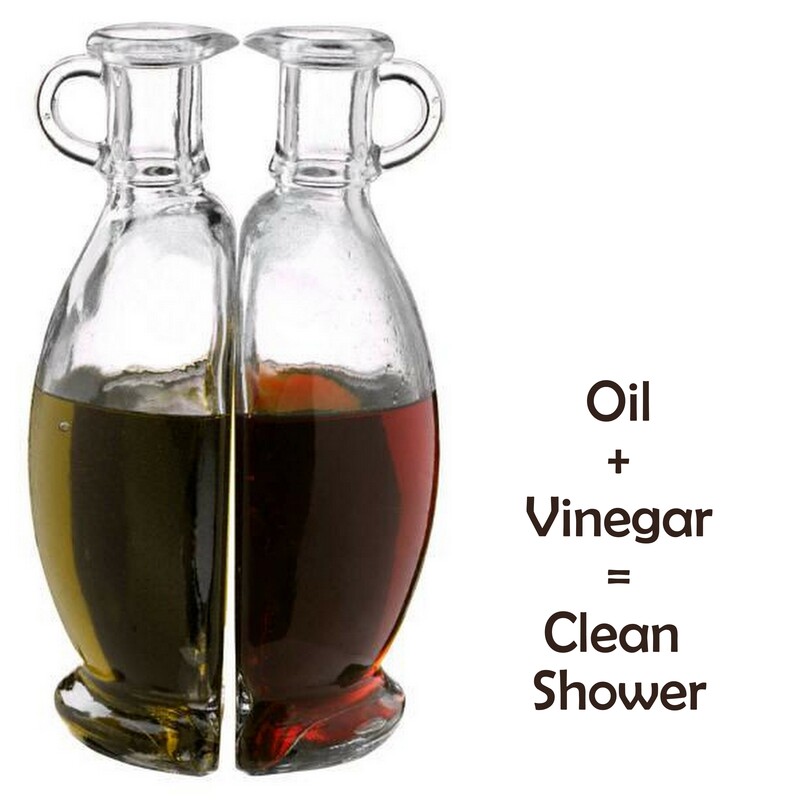 What do oil, vinegar & showers have in common? Clean! It was a complete accident I tell you! My coconut oil (what I use for after shower moisturizer) spilled in the shower one day. Oops, grab a rag, clean it up… WHAT THE HECK? Why is this month old scum completely GONE in that one spot? Hmmmm… try again… this time purposefully spilling the oil, wiping with a damp rag… Gone in that spot too! Incredible! Okay, so Coconut Oil is rather expensive thought I. So, I grabbed the vegetable oil (which we use for deep-frying on the occasional day in which we sin in that manner)… spill, wipe, gone! WOW! Grab a clean sponge & dampen it. Spray down your shower with warm water. Spill some oil (of your choice) on the sponge. Wipe down your shower/bath in circular motions – no need to expend any of that valuable elbow grease here! Spray with 50/50 white vinegar & water. Wipe dry with a dry towel. For more ways to eliminate checmical cleaning products, click here. you use regularly in your home? I’ve read a lot about cloth diapering. Read a lot of articles, watched a lot of videos. The thing that is hard for me is that even when I watch/read stuff it seems so complicated… and I’ve been cloth diapering for going on 4 years! And I don’t think it’s complicated. I want people to feel the freedom to cloth diaper without that overwhelmed feeling you get when something seems too difficult. So, here’s my attempt to take the difficulty out of cloth diapering! First, let me get this out of the way… I am more frugal than anyone I know… so when I say “Use a grocery sack”, you could translate that to be “Use a wetbag”!… just sayin’! I’m all about a cloth diapering system that WORKS… but I’m also pretty conscious of the price of said system. I think this is where people start getting complicated. The selection of diapers & diapering systems is ENORMOUS! Where do you start!? That is the question isn’t it? So many people don’t even make it past this one step. As you can see, there are a LOT of choices out there for cloth diapering – the links above are only a sampling of what is available in each category! There are so many brands and styles and options out there! This article being my opinion, because, well, it’s my blog, I’ll tell you what I think. I have used a variety of diapers in my tenure as a CD mom. And I tell you, I LOVE the system I’m using now. I started with these prefolds & covers. Loved it, until I was introduced to inserts! These inserts are marketed as “doublers” but it’s exactly what I used with my ProRap Diaper Covers. What a convenience to not have to fold anymore! I have also used one-size diaper covers (like this one from Sprout Change)… which, truth be told, are not one size after all. Touted to fit up to 40 pounds, my son outgrew his at 25 pounds. I did LOVE it until he outgrew it though. So… what do I use? I use what I consider to be the simplest system, easy to care for, durable, easy to store, easy to travel… key word: EASY! I use inserts & covers. Sure, AIOs might be “easier”… problem is, they are very expensive. And I’m frugal remember?! First, I suggest purchasing ONE brand & style of cover in the necessary sizes. I have 6 covers in each of 5 sizes. The reason I suggest this is simply because there is less sorting, stuffing, folding, etc. I pile up the covers, I pile up the inserts. Done. I love the ProRap Diaper Covers & suggest the Classic covers in white… though, if you prefer, they do have an adorable line of colors & even prints now! These covers are made with PUL (waterproof fabric), durable Velcro closures, and feature a double gusset around the legs which is phenomenal for preventing leaks. I have tried snap diaper covers, and prefer the ease of Velcro. It’s difficult to snap 4-8 little snaps on a squirmy baby! Yeah, that doesn’t happen with cloth diapers! Just a little tidbit. Second, I suggest Inserts, for the simple reason that you don’t have to fold. There are a variety of inserts available on the market from organic,wool, bamboo, microfleece, and a basic cotton/fleece insert (which is what I prefer because they rinse cleaner faster than the more exotic blends). I haven’t purchased any inserts myself so I can’t tell you which is best (although I have used a microfleece insert and hated it)… but I can tell you they are easy to make. 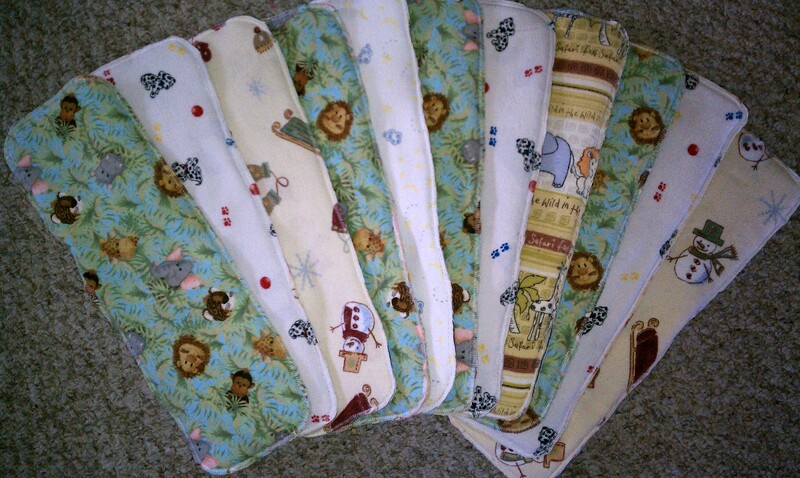 I made all of my inserts… from the plethora of fleece & flannel receiving blankets I had in piles in my kids’ rooms! I’ll try to get a tutorial up soon. I love my fleece/flannel inserts because they are sooo soft and comfortable and easy to clean. Third, I do suggest using cloth wipes. 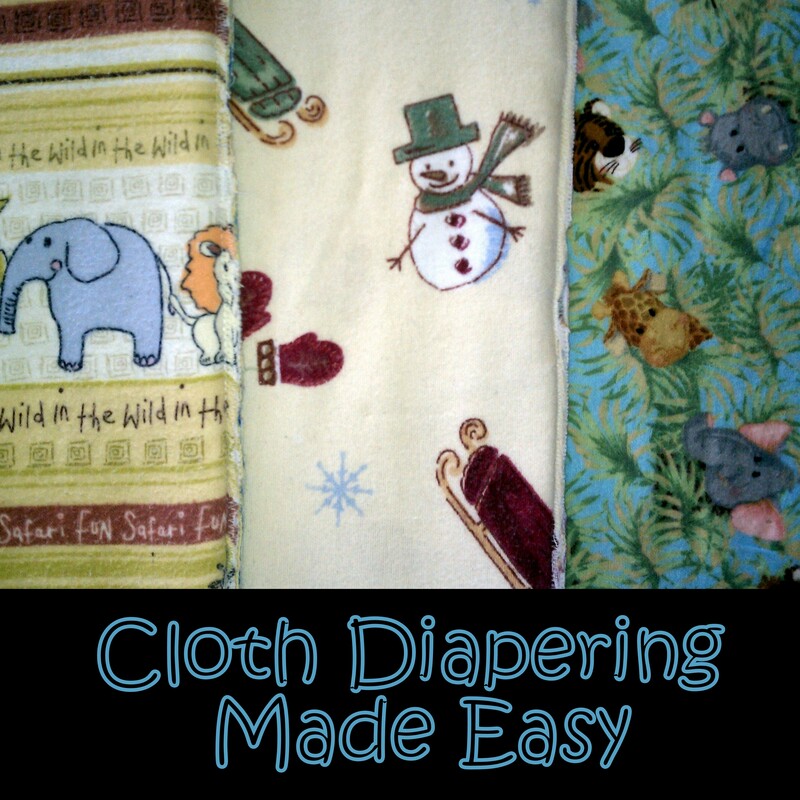 These can be anything from baby washcloths, to scraps of flannel or terrycloth. I have also made all my own wipes from two serged together layers of flannel & terrycloth. These are my homemade inserts… some of them! Once you’ve purchased your cloth diapering system you’ll need to set up a system for organizing your collection. I have moved my changing area around the house so many times trying to figure out the perfect place for changing. And I’ve settled on the dryer! I have a contoured changing pad on the dryer, which obviously sits right next to the washer, you know, where I wash the dirty diapers! I keep four baskets on the shelves above the dryer. Since I have two in diapers, I have one basket for LaLa & one for the Little Monster. These baskets house their size covers, and occasionally some slippers, jammies, whatever. The other two baskets hold the cloth wipes along with a container of water, and the inserts. I also have another small basket with creams in it. On the floor I have two trash cans. One is for trash, the other is lined with a reusable grocery bag (or you could use a wetbag!). This is where I dump soiled diapers when there is another load of wash running, which happens occasionally around here as you can imagine. But, when there isn’t a load in the washer – this is the magic! I just put the dirty diapers IN the washer! No lifting heavy diaper pails, no smell splashy water! Easy peasy! So… Onward. Now you have a baby and you need to diaper him. My personal preference is to use a non-scented paper (disposable) diaper until the little belly stump falls off. When that happens, I gladly switch to cloth! I change at my dryer based changing station. If the diaper is wet, I replace the insert, and the cover if it is wet as well. If the cover is slightly wet but not stinky, I hang it with a clothespin from one of the baskets to dry. If the diaper is soiled and the baby is breastfed only, I just dump the whole thing in the washer (already filled with water and a Tablespoon of bleach), no need to rinse. If the diaper is soiled and the baby is eating solids, I set the insert & cover aside, change the baby, and then take the soiled diaper to the bathroom to rinse. I just rinse in the toilet by flushing and swishing (you could use a diaper sprayer), then I carry the rinsed diaper back to the washer in a small bucket (like an ice cream bucket, or you could use a wetbag). To wipe baby, I wet a few cloths in the container of water I have with the wipes (I’ve tried homemade solutions and found that plain old water works just as well and stays fresh longer too… the scented water tends to get slimy faster) and wipe. I choose to use cloth wipes because there is much less wiping & scrubbing and baby gets quite a bit cleaner. To replace the insert, be sure to fit it inside the gussets of the cover to prevent leaks. If baby is small, fold the insert over in the front, then pull up the cover so it completely covers the insert. 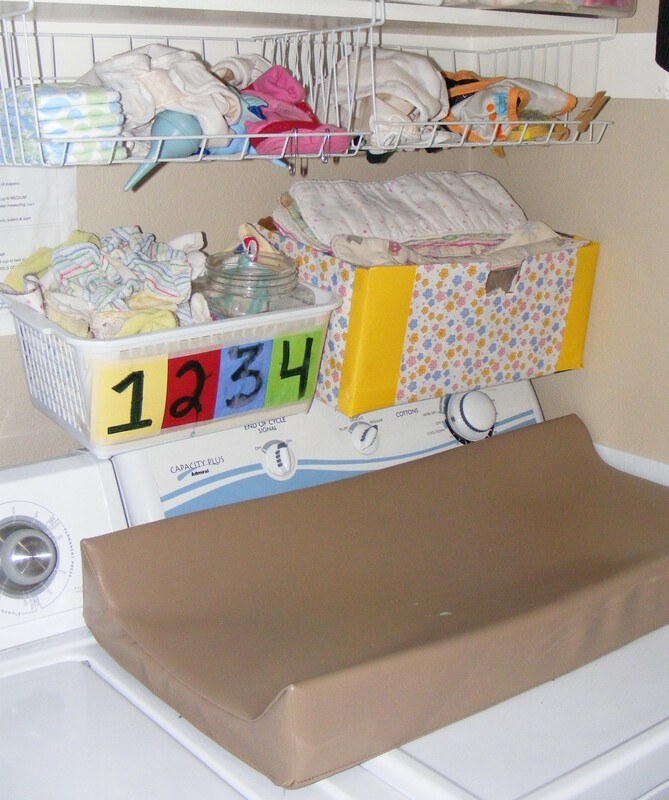 There’s no need to even move the cover out from under baby when changing unless it is soiled. Simply remove the wet/soiled insert & put a dry one in it’s place. It’s time to do the laundry! Since I keep my washer full of water, detergent, and a disinfectant (bleach or vinegar) and put the diapers in as I go, all I have to do is start the machine. Then switch to the dryer or better yet, line dry to reduce stains & further disinfect. This is the regular routine. You may prefer to do an additional rinse cycle, I don’t feel it’s completely necessary unless there is some serious mess in there. I wash my diapers with homemade detergent and 1/2 cup white vinegar or 1 Tablespoon of bleach. Once every couple months I strip my diapers… this involves either hanging the diapers out on the line in a rainstorm, or washing them once with detergent as usual, then once with a couple cups of white vinegar but no detergent, then another time with plain water, and another time in plain water for good measure. The purpose of stripping is to seduce your husband. Whoops… sorry! The purpose of stripping is to rinse out any buildup of soapy residue that has clung to the diapers over time. It’s also helpful if you notice baby has an unexplainable rash… perhaps the diapers just need to be stripped. I typically wash every 2-3 days. Usually that’s a full load since I have two in cloth. When I only had one, I would go 3-4 days between washings. Always close the Velcro before washing! I don’t find that traveling with cloth is terribly different than disposables. 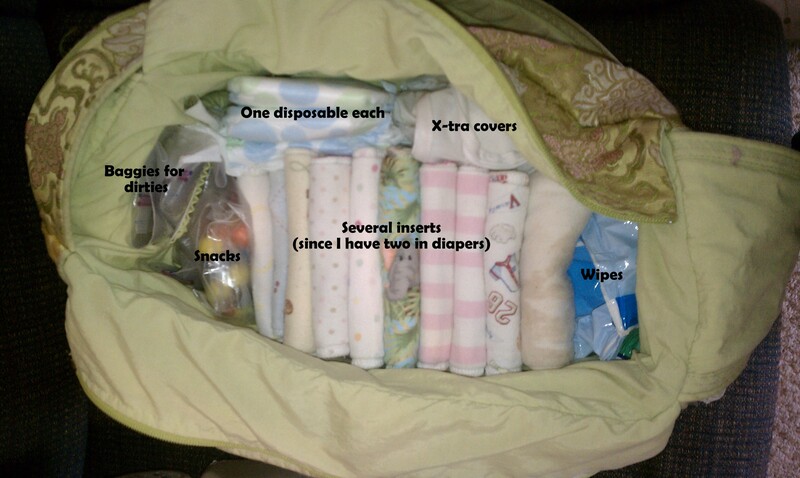 Packing the diaper bag is the same except the addition of a plastic grocery sack (or wetbag) for the wet/soiled diapers. You figure out how much you need as you go. I usually pack several inserts, a cover for each kid, one disposable for each (just in case! ), and a package of wipes (or I’ve heard of packing cloth wipes & a spray bottle of water! – I may just switch to that since I like cloth wipes so much better). Then I pack those little produce sacks I bring home from the grocery store all the time or some ziplocks… that’s what I pack up the dirtys in. No need for anything fancy in my opinion. Keep it simple! When I travel… like go for a weekend… I pack the whole shebang in a Rubbermaid tote or cardboard box. Pile of inserts, pile of covers, and a pile of wipes. Then I set up on the dryer at Grandma’s house, or wherever I’m at. If your host is offended by CD, bring a wet bag or a large trash bag and bring it all home to wash.
Nighttime… So far I haven’t figured out a system for nighttime cloth. They always end up smelling of ammonia and I just don’t like that, so yes, I opt for the paper diapers for nighttime. All in all, I think that’s all you need to know. I really hope this has helped to simplify the cloth diapering process. I know it’s a bit overwhelming at first and you wonder if you’ll even be able to stick it out. At least give it a try… #1 It saves a HUGE amount of money. 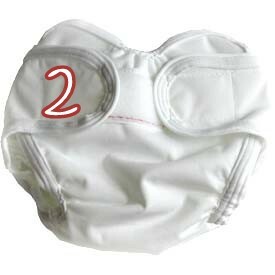 #2 It’s way better for babys little buns than all that bleachy whiteness and ultra-absorbency of paper diapers. #3 It’s sooo cute! #4 It’s all “save the earth” green! Come on… give it a try! You’ll never turn back. And while you’re at it… ditch the toilet paper and go with family cloth! Haha! One step at a time! What are your favorite cloth diapering tips? Blogs are supposed to be focused aren’t they? Like on a particular topic or whatever? Eh… this Mama of three under three is NOT focused at the moment; yet, I still need an outlet… I still need to write. So… I’m going to attempt a blog, for what it’s worth. I need a voice… I need a place to call my own where I can share the things I love. So, perhaps in that sense, I do have a focus. I want to be me… and I feel like there is no room for me anymore. So… perhaps this blog can be me in the meantime! That is, if i ever find time to write. I have several ideas “pending” in the recesses of my mixed up brain, but I don’t have time to write them all today.